Clever Search is not an application to use if you are looking for an application to improve your Internet searches since it is known that this program is yet another adware program. If you have encountered this adware being active on your operating system take immediate measure and remove it once and for all. Even though it is advertised as a great tool that will improve your online experience it in reality does not do that all that great. Mostly such devious marketing strategies are used to trick unsuspecting Internet users into downloading and installing this adware. Do not get fooled by various statements claiming that Clever Search is an excellent program and make sure to stay away from it at all times. 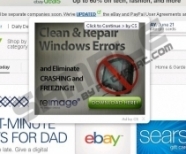 Within this article, we provide further information regarding this adware’s functionality and will provide a comprehensive removal guide that is easy to follow. Since it is impossible to download Clever Search from its official website it is quite natural to assume that it is distributed in other dubious ways. Our research team has been able to find out that in most cases this malicious application is spread via software bundles. Such way of spreading questionable applications is quite common nowadays. To avoid getting your PC in this way make sure to avoid all the third-party download websites and websites linked to online piracy since such sites are known to be the primary source of bundled installers. Besides that make sure to pay your utmost attention to all the setup processes; we strongly advise you to always choose the advanced installation since this way you could be provided with an opportunity to cancel any additional installation. Lastly, the most important thing that you can do to improve your virtual security is to install a professional antimalware tool that would provide your PC with overall security at all times. As soon as Clever Search enters your operating system it will start a background system service named cssvc.exe. This service is the primary cause your web browser will get flooded with unwanted third-party web content. In most cases that unwanted content is presented to you as third-party commercial ads and annoying pop-ups. All of those ads will be presented to you in a random way, whether you like it or not. Thus, it is not surprising that this activity will make surfing the web a frustrating and annoying experience to say the least. This is so because you will be forced to fight through those ads and pop-ups at all times meaning that browsing the web the way you are used to virtually impossible. Unfortunately, killing the malicious system service will not stop this invasive activity entirely. The only way that you can regain the standard functionality of your web browser is by conducting a complete removal of Clever Search. Make sure not to skip any steps during the removal procedure. This is crucial since just one mistake could mean that Clever Search was not removed entirely. It is dangerous because even a few leftover files or registry entries could trigger a silent restoration procedure. Avoid such a case by conducting an in-depth analysis of your PC one you have executed the manual removal. Right-click Clever Search and then select Uninstall. Select Clever Search and click Uninstall. Quick & tested solution for Clever Search removal.